Passive Voice again in context. 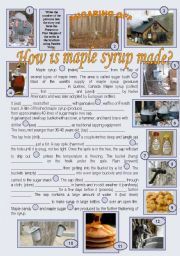 This time maple syrup is in focus. Match the pics to the story and form the Passive of the given verbs. Present and Past Simle is used. Key included. Next part will follow tomorrow. I´m sure you´ll recognise that this work has my FINGERprints on. I worked my FINGERs to the bone doing this ws and cross my FINGERs that you would like it.Hopefully I´ll wrap you all around my little FINGER. 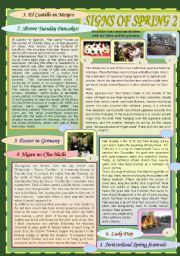 Spring Traditions (3 pages)from eight countries. Reading, matching, comprehension questions, scanning for specific information. Key will follow tomorrow. Have fun. How do we know that spring is here? 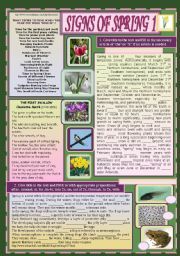 Texts about the season, the metamorphosis of frogs, the migration of swallows and some spring superstitions and quotations. 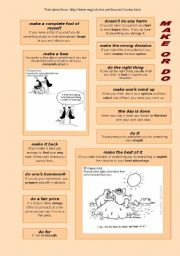 Exercises on definite article, prepositions, present tenses and matching. Key included. Have fun! Winter Olympics. 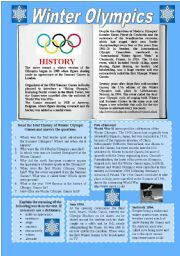 Bief history, interesting facts, questions cheking understanding, vocabulary. Wintersports matching ex, 2010 Winter Olympic logos and their origin. Have fun! How are meteorological data collected worldwide? Learn about it while solving a guided cloze and matching exercise. Have fun! Extended vocabulary of vegetables for a healthy lesson. 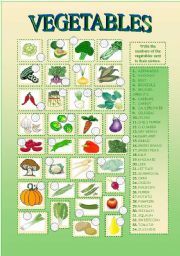 On the second page find the vegetables maching the description + answers. Enjoy. Two simple exercises to winter clothing, winter freetime activities, and some sports gear. Have fun. 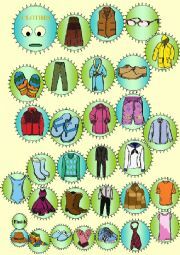 Clothes board game to consolidate or review clothes vocabulary. Thanks to moravc for the fabulous template. Clipart copyrighted Harangozó Tünde. Four pages make-do activity. 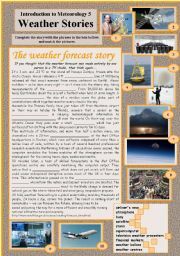 Includes explanation of the phrasal verbs, some cartoons, a gap fillig activity (a complete story) and answer key. The make and do phrasal verbs are more than the usual ones. Animated ppt game about 13 prepositions. 2nd part is at http://www.eslprintables.com/powerpoint.asp?id=51897#thetop. Have fun!! Tic Tac Toe game (colours instead of dots and crosses) with sentence transformation exercises. Fully animated, with all the answers. Directions of use are on the first slide just wait until the title disappears.108 sentences of passive, conditionals, comparisons and what not. Peter is tossing coins in the Magic Well and all his wishes but one come true. Complete the wishes and find the one that was not fulfilled. 13 sentences to practise "I wish ..." + Past Simple. Animated and with splash sound as the coins fall into the well. Have fun! Description in the 3rd slide. Activity about natural disasters. 11 disasters with stimulating pictures and word bank (verbs, nouns, adjectives and useful phrases). 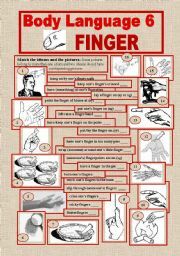 You can use it for oral or for writing activities as well. 2nd part of my London Quiz. Another 11 sights to learn about. Try to guess before you click on the ´What´s this´ button. Have a nice journey on the London Eye.